Adolfo Bezerra de Menezes Cavalcanti was born in the old neighborhood of Freguesia do Riacho de Sangue (Stream of Blood), today Solonopole, in Ceara, Brazil, on August 29 th, 1831. He died in Rio de Janeiro, on April 11th, 1900. In the year of 1838, Adolfo Bezerra de Menezes Cavalcanti, started studying at the public school of the Friar’s Villa, where in only ten months he sufficiently prepared himself to reach the degree of knowledge of his master, who was responsible to guide his first educational phase. At a very early age, he revealed to be extremely intelligent. When he was eleven years old he was able to commence the course on Humanities. At thirteen he knew Latin so well that he not only gave classes to his colleagues, but also was called to replace his teacher every time he had to be absent. everything that he owned, in order to pay off the debt. The creditors, being his friend, refused to accept such a proposal, replying that he could pay them when and how he wanted. for the maintenance of his family, who changed from a previous comfortable condition to a life of privations. given by his teacher Manoel Feliciano Pereira de Carvalho, at the time Chief Surgeon of the Army, Bezerra de Menezes was named his assistant, assuming the position of Surgeon – Lieutenant. In 1861 Bezerra de Menezes was elected the municipal representative of the Liberal Party, however the conservative chief, Haddock Lobo, under the allegation of him being a military doctor, refuted his indication. With the purpose of serving his Party, that needed him in order to obtain majority in the Camera, Bezerra de Menezes decided to retire from the Army. In 1867, he was elected General Deputy, and he was still present in three other lists for a position in the Senate. During his political career, injurious rumors and accusations were acclaimed against him. As it happens with all honest politicians, a torrent of offenses covered his name with insults. However, the test of purity of his soul was given, when, abandoning the public life, he decided to live for the poor, distributing with the needful the little that he possessed. He was always ready to assist the need ones; wherever there was an illness to combat, he would take to the afflicted the comfort of his kind words, the resource of the doctor’s science and the aid of his scarce but yet generous purse. necessary stage to his, not succeeded desire, to make it reach the Rio Doce. He was one of the directors of the Architectural Company that in 1872 opened the “Boulevard September 28,” in the then neighborhood of Vila Isabel, whose name was given to render homage to Princess Isabel. In 1875, he was president of Company Carril S. Cristovão. Returning to politics, he was elected municipal representative in 1876, exercising the mandate up to 1880. He was also president of the Chamber and General Deputy for the County of Rio de Janeiro, in the year of 1880.
after all, it will be embarrassing to have to declare myself ignorant regarding this philosophy, when I have been dedicating myself to the study of all philosophical schools. On August 16th, 1886, an audience of about two thousand of the finest people in town filled the room of honor of the Old Guard, in the Old Guard Street, current May 13th Avenue, in Rio de Janeiro, to hear in silence, excited, amazed, the wise word of the eminent politician, the eminent doctor, the eminent citizen, the eminent Catholic, Dr. Bezerra de Menezes proclaiming his decision to became Spiritist. Brazil became sympathetic with Spiritism. The articles of Max, pseudonym of Bezerra de Menezes, marked the golden time of the spiritist dissemination in Brazil. From November 1886 to December 1893, he wrote enthusiastically and continuously. Bezerra de Menezes referred to the medical activity with the highest regard, “A doctor is not entitled to finish a meal, nor to ask if it is far or near, when an afflicted person knocks on the door. Those who do not help because they are entertaining guests or because they have worked long hours and are tired, or because it is too late at night, bad road or bad weather, because is far or is on the top of the hill, or above all, those who ask for a car for those who have not even resources to pay for the prescription, or that say to those who are crying at their door to seek for another doctor — those are not doctors, but rather medicine dealers, who work for the income and to pay off their college debts. In 1883, a dispersive atmosphere prevailed in the core of the Brazilian Spiritism and those who directed the spiritist nuclei in Rio de Janeiro felt the need of a better- structured union, and for this very reason a stronger one. The Spiritist Centers worked in an autonomous way. Each one of them exercised its activity in a certain way, without having knowledge of the activities developed by the others. This feeling led them to the foundation of the Brazilian Spiritist Federation. soon appeared among them alive discords. Under the auspices of Bezerra de Menezes, and accepting the “instructions” received from the spiritual plane by the medium Frederico Junior, the famous “Spiritist Center” was founded. This, however, didn’t hinder Bezerra to continue collaborating with all other institutions. The Spiritists’ enthusiasm soon faded, and the old worker saw himself abandoned by his companions, reaching the point of being the only participant of the Center. The quarrels were deep among the so-called “mystics” and “scientific,” that is to say, Spiritists who only accepted Spiritism in its religious aspect, and those who only accepted its scientific and philosophical aspect. Federation, position that he occupied until his death. The year of 1900 was just beginning and Bezerra de Menezes suffered a strong brain stroke that kept him in bed, from where he would never recover. A true pilgrimage of visitors went to his house. Sometimes, rich people were seemed there, other times poor individuals; he was visited by the opulent as well as by those who possessed nothing. Upon his death, a true pilgrimage went to his residence in order to pay him homage. On April 17th, under the initiative of Leopoldo Cirne, a group of Bezerra’s friends gathered in order to decide what would be the best way to assist Bezerra’s family. They decided to form a commission directed by senator Quintino Bocaiuva’s, to promote shows and concerts, in benefit of the family of the one who deserved the cognomen of “Brazilian” Kardec. Worthy of mentioning is something that occurred to Dr. Bezerra de Menezes, when he was still a student of Medicine. He was facing serious financial difficulties, needing fifty thousand reis (old Brazilian currency), to pay his college tuition, his rent and other important expenses. His landlord was threatening to evict him without any further consideration. but the visitor insisted and finally, upon thinking about his desperate situation he agreed. beginning of the classes, and the visitor left – leaving Bezerra very happy and relieved, because he would be able to pay his rent and college tuition. Bezerra looked for books in the public library to prepare himself for the classes, but the young man never returned for the lessons. 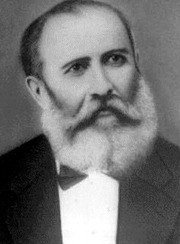 In the year of 1894, in face of the disagreements prevailing in the core of the Brazilian Spiritism, some companions, headed by Dr. Bittencourt Sampaio, decided to invite Bezerra to assume the presidency of the Brazilian Spiritist Federation. –They want me to go back to the Federation. As you all know that old society is without president and totally disoriented. Instead of engaging in the systematic study of Spiritism or the Gospel, it lives to discuss Byzantine thesis and to feed the spirit of hegemony. –The worker of the vineyard, Bittencourt Sampaio said, is always assisted. The Federation can be wrong regarding its doctrinal ways, but it is engaged in the work of assistance to the needful, that is reason enough for it to attract the sympathy of the Lord’s servants. –I agree. But the work of assistance to the needful is adopting exclusively Homeopathy in the treatment of the sick ones, a therapeutic that me and my family follow and that I also recommend to friends, and I am not a homeopathic doctor. This in fact has been creating serious difficulties in my career, turning me into an useless doctor, one that doesn’t believe in the official medicine and that tells others to follow the Spirits’ advices, which hinder my right to exercise my profession. –And why don’t you become a homeopathic doctor? Bittencourt asked. –It is better this way. It will be easier for us to help you in the treatment of our siblings. –How, kind Spirit? Are you suggesting that I make my living out of Spiritism? –Of course not! You will live of your profession, giving to your patients the fruit of your human knowledge, studying Homeopathy as our friend Bittencourt suggested.